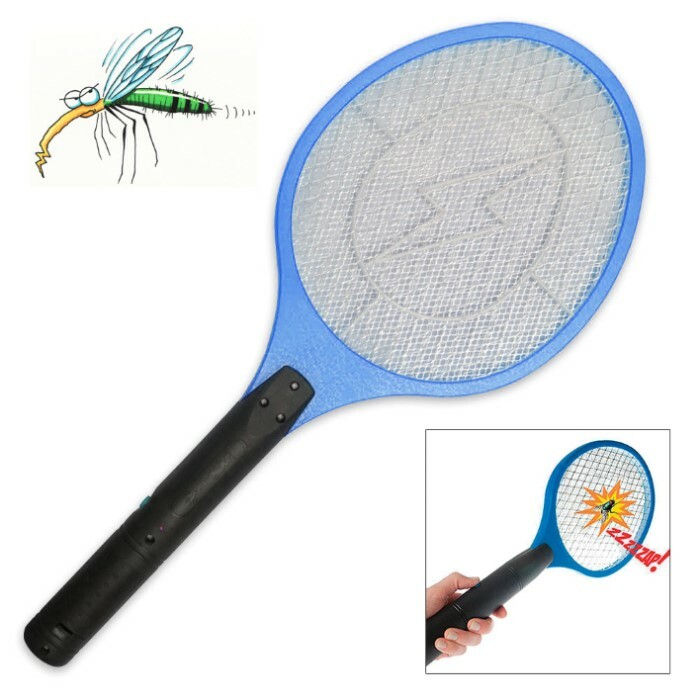 Electric Bug Zapper Fly Swatter | BUDK.com - Knives & Swords At The Lowest Prices! This patented triple-layered electric bug swatter kills all flying insects such as mosquitoes, flies, gnats, and even spiders on contact. Praised as the most effective, convenient and hygienic insect terminator, you can take it anywhere you go! It's great for camping, BBQ's, the beach or fishing. Not a toy! I have been waiting for a chance to use it. It is ineffective against gnats & fruit flies. Yesterday there was a huge Wolf Spider on the sofa. I grabbed the racket and touched him. There was a loud zap. Afterwards I couldn't find the corpse. He was instantly carbonized. It was the high point of my day. Thank you for selling me such a fun, useful device. Got it as a joke for my wife who has mosquito disease phobia. The thing works really well and she will now sit out in the back yard again. Warnings. 1) If you nail a big bug flick the zapper to toss the body off or it will sit on the web and fry. 2) The web doe snot discharge right after you let go of the On button. I tap it against a leaf to discharge it so no one gets zapped. Gentle waving into flying insects works very well! !Pop and zap!! Hitting is NOT a method, but, simply place OVER an insect-spider-etc on a WALL, and, the bug TRIES to get away or fly, ZAP!!! !Crawling roaches same method, place OVER, they TRY escaping and ZAP!!! Bottom line: Place OVER/NEAR so the victim can TRY escaping, and, the bug will commit suicide contacting the interior racket grid area. Pressing the small handle BUTTON, activate the voltage, green light shows as ON , then, zap!! Gifted to all relatives who LOVE it ! !